Xishuangbanna is a subtropical land of natural beauty and vibrant ethnic customs. It lies along the Myanmar (Burma) and Laos borders. Top on most tourist lists is visiting the Dai villages (see photo) and attending their cultural events (which include ethnic dancing and singing). 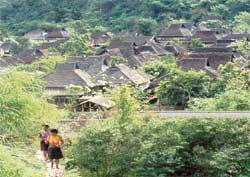 You will experience authentically traditional Dai villages, not the type fashioned for tourists. The dry season runs from mid Fall to early spring. The heaviest downpours occur during the summer months. In summer, do your sightseeing in the morning or late afternoon. It can become hot and humid during the middle of the day. They include the subtropical botanical gardens, the unspoiled rain forests (where wild elephants, leopards and Bengalese tigers roam), the White Pagoda of Manfeilong, and the Octagonal Pavilion of Jingzhen.